1. Wash and dry the leaves on a kitchen towel, make sure its dried thoroughly. Then coarsely chop the leaves along with the stems discarding hard ones. 2. Heat oil in a large pan, add mustard seeds and let it splutter for a minute, then add green chillies and the rest of the seasoning ingredients and let it fry for a minute. 3. 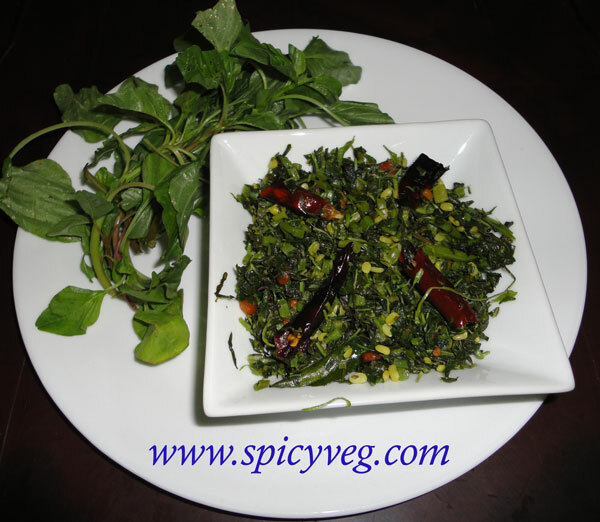 Add the chopped leaves and stir occasionally for even cooking. 4. Soak moong dal for 10 min.Drain the water and keep aside. 5. The leaves will shrink down and now is the time to add moong dal. Mix well and add salt cover for another 2 mins till it dries out off excess water. 6. Serve with Rice and dal or Rotis/Indian flat bread.